Right. A mixture of sickness, foreign travel and anniversary gossip columns have made Waiting For Tommy a little spotty of late. Hopefully we'll keep this run going weekly for a nice chunk. Now. Neal Adams. David Choe. Frank Miller. There are some people in comics who the word 'maverick' seems to suit perfectly. But I don't want to interview them right now, I want to talk to Rob Liefeld. I don't know why, I'm just attracted to the guy. Must be his smile. I'm not alone. Despite having the worst rep in comics outside CrossGen, he's constantly bouncing back with new series, new ideas and new comics, some of which he actually publishes. And now he's back at Marvel as X-Men Reloaded starts to resemble X-Men Revisited. A bit like Brideshead Revisited with less stiff upper lip and more explosions. And X-Force is slap bang in the middle of the action. So what's the bad boy of comics up to right now? RICHARD JOHNSTON: This year, it looks like there'll be a lot of books eying up the Top spot. Jim Lee's Superman. Warren Ellis' Ultimate Fantastic Four. Joss Whedon's Astonishing X-Men. Bryan Singer's Ultimate X-Men. What are your chances of taking their crowns? ROB LIEFELD: No chance. Zero. Honestly if we can break the top twenty I think that Fabe and I would be thrilled with that. I see us as more of a complimentary book to the X-office rather than a flagship title. 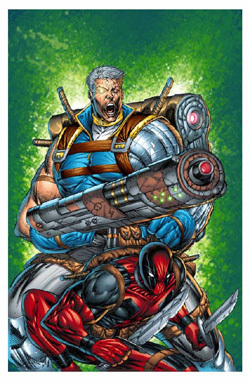 CABLE/DEADPOOL #1 - SIGNED BY WRITER FABIAN NICIEZA! RICHARD: See, I dunno. Despite, or maybe because of, the hostility some of your work engenders, there's a curiosity, a fascination with your work. It's like people who hate Howard Stern, they often still listen to him. There's not many people who can rely on an audience who loves you and hates you to both buy your book. I really think it could surprise people. Whenever you work on an established mainstream comics property, sales boom. X-Force, Captain America, Wolverine... why do you think this time will be different? ROB: I think fans will give it a break much more so than retailers. I won't mind at all if we build over time, if that's possible. Both the characters and myself are in the same boat, viewed as sort of old, outdated, best days seem to be behind us, etc. Like I said before, no guarantees on this project, the characters were virtually kicked to the curb years ago, they fell out of favor they were viewed as products of a bygone era. There's so much ground to make up it's daunting. RICHARD: Not too long ago, you said that you only expected to work with Marvel after the current regime. Did you change your mind, or do you believe the regime at Marvel has changed? If so, how? ROB: I think the thinking at Marvel changed. I absolutely believed that the current regime had no interest in working with me for a considerable period of time, I didn't believe that I'd be doing anything with Quesada and Jemas. The brass at Marvel can certainly attest to the fact that I initially thought the request to do the Cable/Deadpool covers was a hoax. I thought I was being punk'd. Maybe I still am. RICHARD: April's long gone!... but seriously, there do seem to be changes at Marvel. Reverting their publishing policies and even to the same books, that flourished when you last did major work for them. Less politics, more traditional superheroics, variant covers, lack of experimentation, removal of creator-owned titles, X-Force back the way it was - is that fair? Some would certainly see this as a creative step backwards to revisit your past glories - so what is it that attracts you back again? And is it healthy? ROB: Well, obviously I think the notion that it is a step backwards is crap and not because they're working with this old dinosaur again. The fans have spoken and they've crowned some very straight forward commercial work with the top crowns in the industry. Amazing Spider Man, Ultimate Spider Man and Lee/Loeb's Batman sat at the top of the charts for the last 2 years. Each book was very liberal with heavy doses of splashy images, tons of action with flying kicks and punches. Quietly I watched and wondered if the message would be received and clearly it has been. The result has been Batman/Superman, Silvestri's X-Men, Ultimate Six, Teen Titans and others including X-Force which contain a nice balance of Exciting splashy images with exciting soap opera intrigue and drama. The fans as they always have, have the power and when they speak, the industry responds.